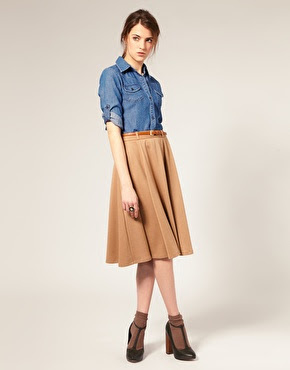 Somewhat longer skirts in a flared shape are very in fashion right now, though they can be hard to pull off! Look for an A-line shape so there's not too much volume and a hemline that hits right below the knee. Buy this one at ASOS for $63 in camel or black. I would totally scoop this up if there was a petite version!